Store on the bathroom counter. Love this! I buy clinique eye make up remover because it's the only one that has ever seemed to work. It's expensive though! I will have to give this a try. I’ve been using this every night for over a year now! I love it. does the castile soap sting? No, the Castile soap is very gentle and there is such a small amount it does not sting if you get it in your eyes. I love this too! I will be making it tomorrow. Yay! You may also want to check out Crunchy Betty – she rocks! Found you from Simple Organic's link up. Wonderful! I've been meaning to buy more eye make-up remover. Going to try this first. Thanks for sharing! New follower via It's a Keeper Thursday. Come by for a visit. I know you'll find something delicious! What a great idea! Thank you for sharing this wonderful tutorial with the Gallery of Favorites. I hope you will join us and share a post again tomorrow. Great recipe! Definitely going to try! will be trying it, i pay big prices for natural products at whole foods, so this is great! This is perfect! New follower who found you today, can u tell me how long this recipe should keep for? @Rhiannon I'm so happy you found me:) This recipe should keep for a year. Wow, thats ages! Thanks heaps, out to buy some of the ingredients! This recipe looks great! I really want to try this, and while I don’t have the mild baby type of Dr. Bronner’s castile soap, I do have some of the lavender stuff. Would this work as well? Or would it be irritating do you think? It may burn. The baby mild stuff is supposed to be a no more tears formula like J&J baby shampoo is.The baby mild castile is available on Amazon. Love this idea! I am wondering if you happen to know whether all the Dr. Bronner’s castille soaps contain aloe vera? Or is it just the baby one? I have ultra sensitive skin and react to aloe on the face. Oops- asked too soon 🙂 It appears there are 2 baby mild varieties, and the basic one doesn’t have aloe. Looking forward to giving this a try! If you use coconut oil do you melt it first or use as a solid ? Does this recipe remove waterproof eye makeup? I can’t seem to find one that does! I just tried this with waterproof mascara, and had no luck. I did use it all over my skin to remove my foundation though, since I wash my face with raw honey and like to have a clean sweep before that. I used to work for LUSH Cosmetics and got attached to one of their products called “Ultrabland” (http://www.lushusa.com/Ultrabland/02749,en_US,pd.html) that worked great for my waterproof mascara. You just have to make sure to remove it with a near-hot washcloth (as hot as you can stand) since it is basically like an oil cleansing method. I made a body butter awhile back, and as I realized I didn’t have any makeup remover with me the other night, I realized that my body butter ingredients were similar in effect to LUSH’s Ultrabland… wouldn’t you know it– worked like a charm! Place all of the ingredients in a heat-resistant container. On the stove top in a water bath/double boiler or microwave, SLOWLY melt all of the ingredients over LOW heat. Stir well and pour into a clean container, letting the mixture cool completely and set, or let set for about 10 minutes in the fridge and whip to a fluffy consistency using an electric mixer. Yields about 4 ounces. Forgot to mention that if using essential oils to add them after the taking the pan off the heat. I wouldn’t use essential oils near the eyes. They can be irritating. Have you used e.o.s on eyes before? Straight up coconut oil works well for the waterproof stuff. Just wipe on, wipe off. Amazing!!! I don’t really like to use traditional eye make-up remover because it is so clingy on my skin that it tends to make my make-up smudge the next day even after washing. Actually I avoid it unless I just can’t scrub off my make-up any other way. But I gave this one a shot because it was so simple (I used apricot kernel oil because I had it). 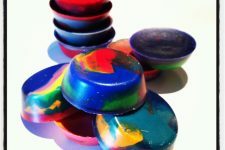 Really my goal was just to build courage in order to try making the facesoap. But I fell in love. I let my sister-in-law try it when she was staying with me after a wedding. She is also in love. She said she’s never used an eye make-up remover that actually removed every trace of make-up quite like yours does. And it’s so cheap! So, hats off Andrea & thanks! I tried this a few weeks back and I love it!!!!! It takes it all off and is gentle on my eyes. I will never buy eye makeup remover. It’s truly is such a simple, but super effective recipe! We love it in our house too 🙂 I’m so happy you found the recipe useful. I have these ingredients and am excited to give it a try. Thanks!!! I just tried this today but I did not have the baby-mild soap, I only had Dr. Bronners tea tree one. It worked wonderfully! I love that it didn’t sting my eyes and it cleaned all of my mascara off really easily. This recipe is a keeper. Love that it’s just pennies per recipe to make! I make mine with coconut oil,water and Johnson’s Baby shampoo. It works great! I have heard of using baby shampoo, but I don’t want all the nasty ingredients. I think using the castile soap might be better? When I use coconut oil (which is my facial moisturizer, too) to remove eye makeup, it makes my vision all blurry. or you can use coconut oil. works great. This recipe was perfect, thank you! Throwing away my Neutrogena remover as I type this. Never going back! So exciting! I made this tonight, used it and then made the following adjustments. Because I use waterproof mascara, I needed something a little more effective. see how it goes:) Thanks for the recipe! Looking forward to giving this a try in the near future. The store bought ones I have tried burn my eyes. I generally use Mally eye makeup remover, but at it’s price can’t afford it. I’ll definitely be making this. Does one have to use distilled water, or is purified, filtered water fine? Is regular castile soap fine, or must it be the baby-mild version? I have begun just using ordinary coconut oil as makeup remover. I just dip a bit of the cotton in the oil, make sure it’s evenly distributed and then carefully wipe my eyes clean. Do you have any recipes? I just bought a 54 ounce can and its just sitting there. Love this! I can’t wait to try! Make up remover is so expensive and has a lot of not so great ingredients! This is much simpler and I know what I am putting near my eyes! Hi do you think I could use sunflower oil? Another excellent find browsing pinterest! So you are suppposed to take off your eye makeup? Did this tonight and it was amazing. Took off all my make up plus cleaned all the oil and grime off from the day as well. My face feels clean and amazing. Thank you so much. Namaste. I love this! 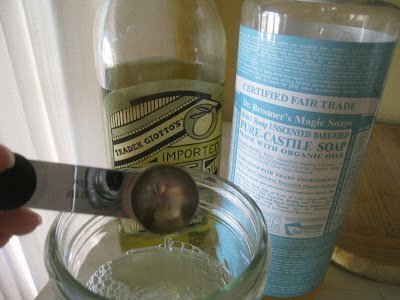 It was so simple to make and it works as well as any store-bought eye makeup remover. I will never buy eye makeup remover again. Thank you for sharing this recipe. 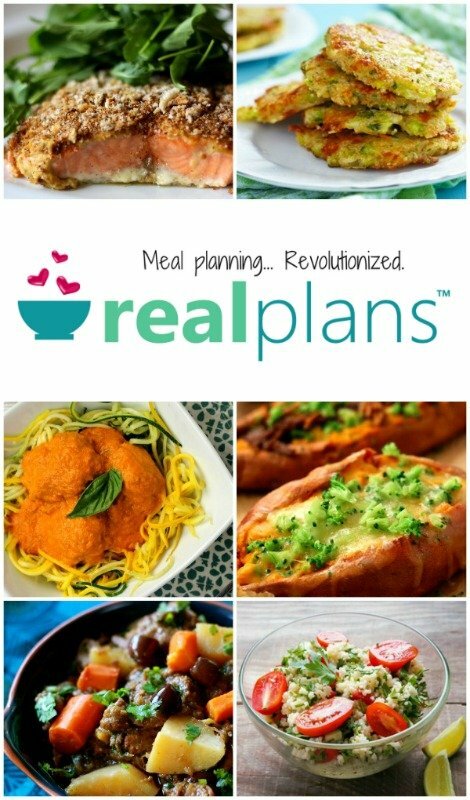 I am very excited about all of your recipes and definitly want to try them myself! I was just wondering how I go about distilling water at home? Or can I buy it? You can also buy Dr. Bronner’s products at http://www.vitacost.com. I can send anyone a referral a link if I have your email and you’ll get a discount code for $10 off a $30 purchase, and I’ll get a $10 coupon as well! Then anyone you send the link to who names you as a referral will get you another $10 coupon once they order. Right now if you spend $25 on Dr. Bronner’s products and/or any vitacost brand name product, you get free shipping. Please email me if anyone’s interested in the referral! Could you please send me a referral like to this vitacost.com. I would love to be able to get coupons for this website to be able to purchase the castile soap. Thank you so very much. I use vitacost alot and would love to order the dr bonners and give you the credit too. I don’t buy eye make-up remover anymore. 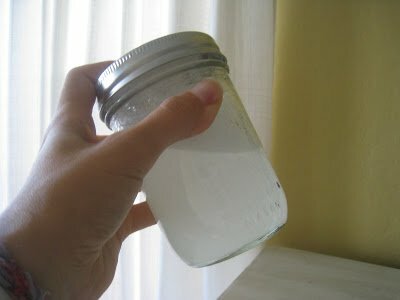 For almost 2 years now, I’ve been using my own home made make-up remover consisting of just water and baby oil which I put in a former eye make-up remover bottle. Use face towels to clean your whole face. 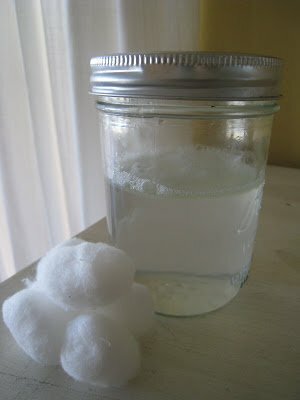 why not just use some baby oil on a cotton ball? it always works for me, and baby oil is less expensive than all of these ingredients…. This is not only about ease and cheapness of ingredients but about using natural and/or organic products. With this recipe, you know every ingredient that you’re putting on your face. Unlike using baby oil! I use waterproof mascara and the only thing I use to remove it is organic EVOO 1st cold pressed….works perfect every time! 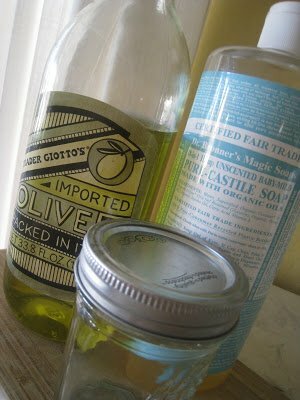 Is it possible to use Extra Virgin Olive Oil? or should it be regular olive oil? Thanks! Sara, I just want to use the purest form of olive oil. It has so many uses. Don’t be scared off by the organic part….you can purchase a 16.9 ounce bottle for under $10.00 and that is a whole lot cheaper than any of the makeup removers out there on the market. I hope this helps you. Have a great day. try using rose water instead of regular water. I scaled this down (a lot!) And love it. I have very sensitive skin and this has worked very well for me. It’s not expensive at all (mind you I always havethese simple ingredients, but for someone who doesn’t keep these things on hand I can understand the ‘expensive’ comments above). Thank you for sharing your recipe!! 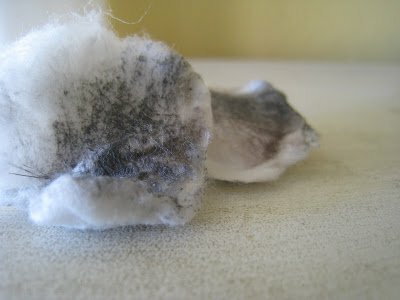 I became allergic to the recommended makeup remover when I used it to remove long-lasting lipstick. My lips became swollen and the skin cracked and peeled. Even washing my face vigorously was enough to get the hives-like reaction. Once I started using just olive oil to remove all my makeup this no longer happened; olive oil alone removes everything I use, even waterproof mascara, at least it does for me. Plus my skin is very happy. I was excited to try this but when researching the castile soap there was a warning on the bottle to keep out of your eyes. So now I am worried about trying it. Any suggestions or comments on this? Thanks. I’ve been using this for 2 weeks now and it works great! And I made it for pennies, can’t believe I’ve been paying so much for the toxic store-bought stuff. It leaves my eye area nice and soft. 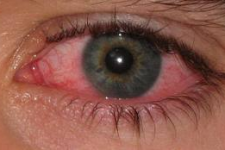 I saturate a cotton ball and place it on my eyelid for about 20 to 30 seconds and then wipe off. I also found that applying it directly to my eyelid from the bottle while in the shower works great too. A lot less rubbing. I will only make a cup at a time but what is the shelf life of this stuff for safety measures? I been using this easy and natural make-up remover for years and it removed water-proof make-up with ease. 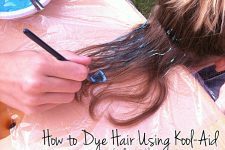 You will need just two ingredients witch hazel and jojoba oil or EVOO. I use a travel size container with a flip top. 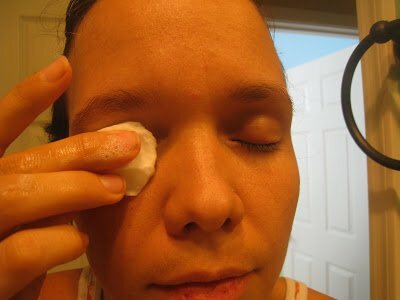 I put 8 part witch hazel and 2 part oil and shake to mix ingredients and apply to cotton pad/ball and remove make-up. No sting of the eye at all. I just use either olive oil (EVOO because that is all I have in my house) or coconut oil. This works great and I always have one or the other on hand at all times anyway. I used to use vaseline (ick) until I became older and wiser as to what I put on my skin. What I found surprising is how hard to find and expensive the castile soap is. I could not find the unscented anywhere in my area so had to choose between peppermint and lavender. I hope that does not make a difference. But it was expensive for a large bottle that you only need a tsp or so from. But if it works and I like it I should be set for life now with the big bottle LOL. Does it work on waterproof mascara? I made this today and used it and I love it so much…mine suds up a lot does anyone else have this problem? What could I do to avoid it? I didn’t shake it it suds up before I even gently shook it. Awesome idea for a natural, cheaper make-up remover. Lotion also works for removing make-up! Just put it on and wipe it off- no scrubbing! I thought when mixing water & oil you would need a perservative? I was curious where you buy one of the items. I have the water and the olive oil but not the other. I have combo skin that is more oily during the summer and more dry during the winter, and I find Citrus Clear’s Sensitive Wash works great for me year round. The Citrus Clear Sensitive works well to dissolve my makeup and clean my skin. I use it in conjunction with their moisturizer since its light. With those two products, my skin has never been better!